Welding and brazing are, if executed right, the strongest possible connection method for two or more parts of same or very similar metal. Due to this, there are welding wires similar to nearly all metals around that are in industrial use. Many of them are good for maille use, especially if used in MIG wire form. MIG welding uses wire in a couple of different wire diameters; typical are 0.6mm, 0.8mm, 1.0mm, 1.2mm, and 1.6mm wire diameter if documented metric - in fact the welding wire norms define the diameters in fractional inches, so the metric data are just 'nearest-match' ones for easier identification. Despite differing reports, these diameters are used in US as well, and I am not aware of MIG wires that are made especially for the AWG or SWG gauge systems (there are some wire diameters near to a particular gauge mark, but if you use a caliper you'll see). MIG wires are very practical for mailleing, as they are delivered readily on spools, relatively safe against 'wooling', and easy to store. There are thicker wires around, but these are typically delivered as straight WIG/TIG welding rods of usually 1 meter or 3ft. length; common diameters are 2.0, 2.4, or 3.2mm (of course real data are also fractional inch), besides thinner ones most often also available as MIG wire, and thicker ones for some alloys. The downside of these short wire lengths, especially in high diameters should be clear - short coils yielding relatively few rings and resulting in relatively large scrap amounts; so if a material is available as MIG wire on spools, it should always be preferred. Shown are a large K300 cage spool with 50mm standard adapter mounted, the medium sized B200, and a small B100 spool. The large 300mm spools are available as shown, or also as plastic spools. Manufacturers tend to fill the spools just to the nominal weight; even if some additional pounds would fit on the spool, it's usually not done. All three spool types are made of plastic, the 300mm alternatively as 'wire cage spool'. The 100mm spool has an axis bore of 16mm diameter, while the 200 and 300mm type have a standard 50mm bore; 300mm cage spools have an inner diameter of 180mm, but can be fitted with an adapter for the standard 50mm mount. 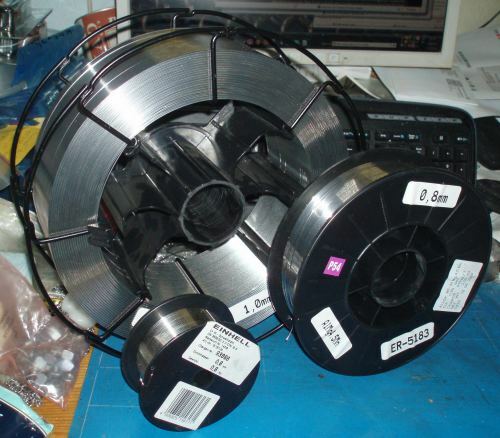 There are larger spool sizes available, but not very often available for nonindustrial users. So I will just mention their existance, but no data. First: Never buy flux cored wire for mailleing, that is usually made for cheaper constructed MIG welding devices (unless you use it for its original purpose of welding using such machines). It's not worth even thinking about using this wire for maille. It's cheap and weak stuff, unuseable for mailleing. There ARE some better cored wires made for difficult welding tasks that would be impossible without core, but that doesn't make them suitable for mailleing. Just don't use them. But let's continue with useable materials that promise good results. The best Al wires for mailleing are AlMg alloys, that combine a sufficient hardness with a good shine. The best ones are imho AlMg5 (ER-5356), AlMg4.5Mn (ER-5183, my personal favorite), AlMg5Mn (ER-5556), and AlMg4.5MnZr (ER-5087); other AlMg alloys with lower Magnesium content (other members of ER-5000 class) work as well, but are softer. In my opinion AlSi alloys (ER-4000 class) are too soft - I dislike them, but opinions differ. The best maille-useable Steel MIG wires belong to the ER-300 class, that are stainless Chromium-Nickel steels with relatively similar composition, and usually small amounts of other alloying elements to steer their properties for their original purpose - don't forget that these are made for welding and maille is a secondary use. While imho all ER-300 class steels are an excellent choice for maille, there are some that have specific, notable features. ER-304: usually relatively hard, good armor stuff. ER-307: Antimagnetic, and very tough steel, but often not as hard as other steels of this family. It's my personal armor favorite, nevertheless. ER-308: Good universal stainless steel, combines many good features, and few downsides. ER-316: Very good corrosion resistance, often used for pieces in direct skin contact, piercings, etc. ; may be mechanically a little bit less stable, but not distinct enough to exclude from maille use - the advantages count here, so this is my favorite jewellery steel. It shall not be concealed, that these steels contain a significant amount of Nickel - there are people that react allergic to Nickel, so these fine materials should not be used for making jewellery for these. Who sells stainless steel jewellery, should never hide this information, and point to alternatives like ear wires or complete pieces made of Niobium or Titanium. Another steel welding wire with good availability is ER-70 class wire (also called SG-2 or SG-3), that is a relatively soft, NOT corrosion resitant wire, and is often delivered with a thin copper plating. Due to lacking corrosion resistance it's not useable for jewellery, but armorers who make riveted maille might like it if they can get the right diameter. I have no experience with maille riveting yet, so this is a 2nd-hand information. Personally, I simply don't use it at all. There are a couple of other steel welding wire types around, even Nickel-free but fairly corrosion resistant ones, but if not getting by chance, it's usually not worth searching explicitly for them. ER-CuAl-A1 (CuAl8): A seawater resistant, and relatively bright, brasslike looking Bronze type. Many maillers dislike this tough and springy stuff that requires some effort to work with. But I like it as partner for steel. ER-Cu (CuSn1): Less than a percent of Tin added to else technically pure Copper - in result the alloy retains most of color and tarnish behavior of pure Copper, but gains already a bit hardness, so its springback is similar to Bright Aluminium, what makes mixed-metal designs easier. ER-CuSn (CuSn6): Higher Tin content, makes alloy already a bit harder and springier - tarnish is also influenced, as it ages more brownish and darker as pure Copper. This alloy and its sibling CuSn5P are what is usually sold as 'Jeweller's Bronze'. ER-CuSi (SuSi3): Copper alloyed with Silicon - mechanically not really improved, but gives a fairly quick and dark tarnish. This is an alloy that I personally dislike - your mileage may vary. There are a couple of other materials, like Titanium alloys and many more available from welding suppliers, but these are not only expensive, but also not easily available. My collected welding wire experiences, showing a bit more info as given above are also downloadable as HTML table http://zili.de/maille/welding-wire.htm. These tables are updated on a regular basis, when new experiences with materials are collected. Note: This table contains my personal experiences - So it's just as complete as I have worked with yet. Have fun, and don't hesitate to ask me per PM, if questions arise.